Posted on Monday, October 22nd, 2012 at 9:17 am by Ty Anderson. It looks like Microsoft is going to go ahead and release Office 2013 sooner rather than later. I suppose you can argue they already have with the recent pre-ordering of Windows Surface (which comes with Office 2013 RT). Whether or not you consider Office 2013 RT to really be Office is up to you. It can be your opinion. Whether you do or don’t, my point is the same. There is a new Office in town and he has a new deputy named Visual Studio 2012. Developers that want to use Add-in Express for Office to build with both of these “new guys” (i.e. Office 2013 and VS 2012) need to know we have you covered. 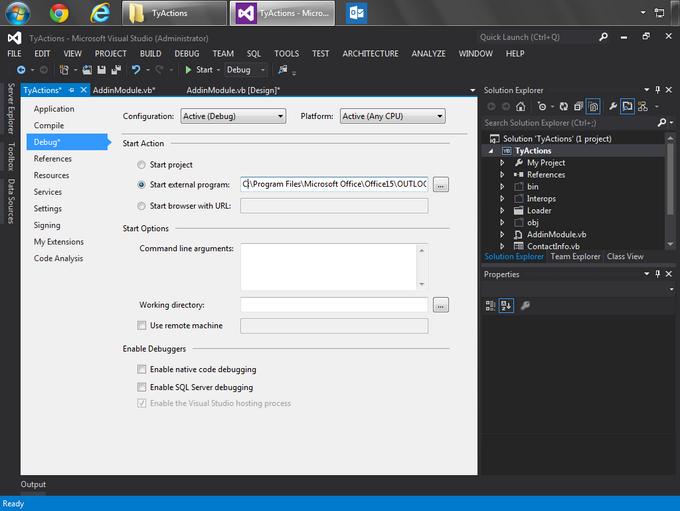 Upgrading your solutions to Visual Studio 2012 is easy and Add-In Express fully supports each of them. In this article, Part 4 of “Building a better Outlook add-in” series, I’ll show you how to add custom context menus and a custom main menu in the Outlook add-in (TyActions add-in). To make today truly exciting (even if you are un-caffeinated), we’ll upgrade the existing code to target the “new guys”. We won’t necessarily go in this order however. Let’s get to work. Upgrading the solutions is as easy as 1-2-3. That’s it. You’re ready to go and have full support of all version of Office 2013-2000. If you want to add debugging support to the TyActions project, complete step 4. Caffeinated or not, I hope you’re excited and ready to tackle the tasks ahead. We’ll add two custom context menus and a main menu to our Outlook plug-in. We need two right-click menus to support Outlook 2010 and 2013 as well as pre-2010 versions of Outlook. The custom main menu is superfluous in terms of the features we will add to them. But I don’t care. I’m including them because they are important to understand as you might need them one day. Open the core part of your project, AddInModule, in design view, then add a new Ribbon Context Menu component (AdxRibbonContextMenu) using the AddInModule’s toolbar and complete the following steps. In the visual designer, select AdxRibbonContextMenu1. Find the ContextMenuNames property and click the ellipses button to open the Context Menu Names dialog box. In the first row, expand the drop down and select Outlook.Explorer.ContextMenuMailItem. Click the OK button. Change the Ribbons property to OutlookExplorer. 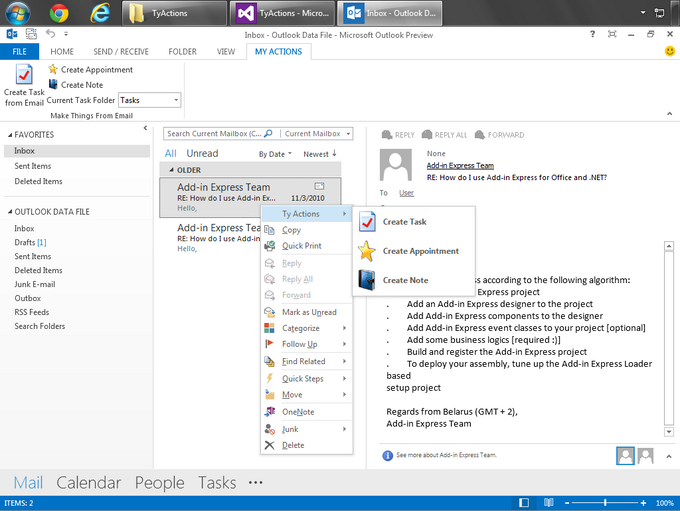 This context menu works great for Outlook 2010 and 2013. But, one of our requirements is to support Outlook 2003-2010. What this means is we need to add a context menu that will work with versions prior to Outlook 2010. 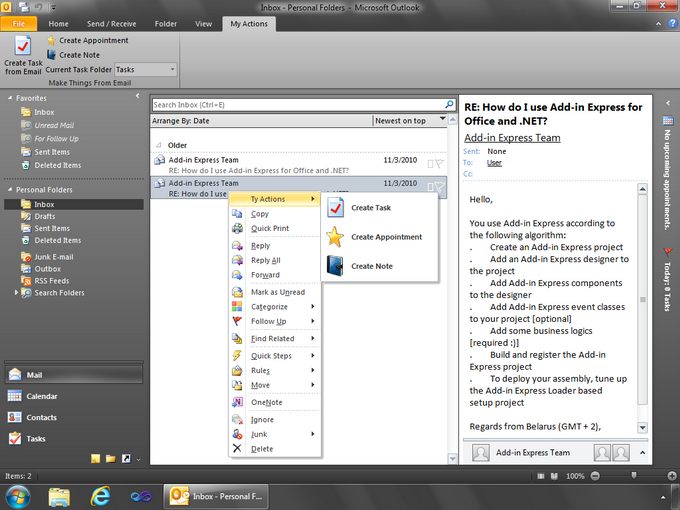 Outlook 2010 is the first version to support the ribbon in the explorer window. This means we need to use traditional, non-ribbon or command-bar based, right click menus. So, let’s add one. These properties tell the TyActions add-in which context menu should display our customizations and which Office application should display them. It is funny that the popup menu we target here has the name “Context Menu”. There are other right-click menus but “Context Menu” is the main one. Confused? Don’t be. It’ll all shake out… just follow my lead. We need to add one more menu, Outlook main menu, and then we’ll write some code. Believe it or not, we are more than hallway done here. 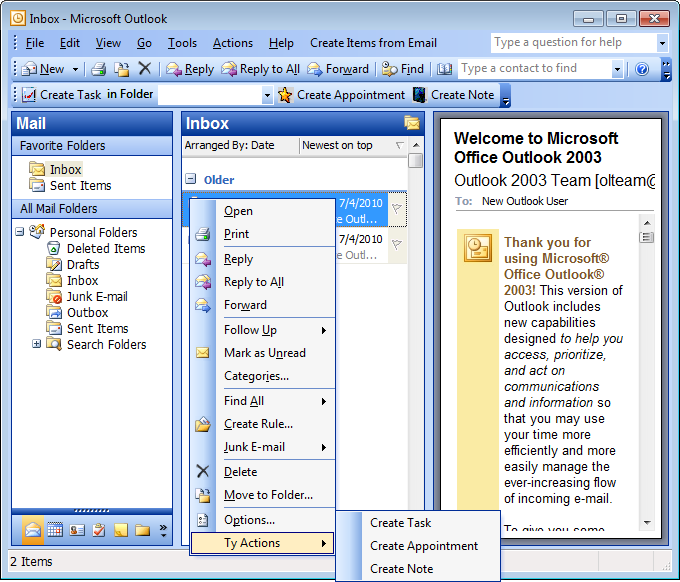 The custom main menu we’ll create also targets pre-Outlook 2010 versions, i.e. Outlook 2007-2000. The main menu is the menu bar that resides above all traditional Office toolbars. The TyActions’s custom Outlook menu bar duplicates the functionality of the context menus as well as the custom toolbar added in a preview edition of this series. Because they are redundant (at least in terms of their underlying code), you can choose to add them or not. But for my sake, please read along so you know what they do in case you need to know about them some day. We are ready to write some code, this will not take long. The logic for our custom Outlook menus already exists. Well, that is if you have read the previous articles in this series and have completed their steps. I’ll assume this is the case and we’ll continue. As you no doubt noticed, there is nothing complicated going on here. Each button event calls CreatedLinkedItem and specifies the type of Outlook item to create. The trick is to make sure we match the Outlook type with the correct buttons. Just like in Part 3, we need to prevent pre-Outlook 2010 user interface elements from displaying in Outlook 2010 and Outlook 2013. This task is easily accomplished with two lines of code. I have included the full AddinInitialize event here for easier copying and pasting. For your convenience, I have highlighted the two new lines. Let’s see some action from our Outlook add-in. Go ahead and build the project and register it on your system. Both of these commands reside in Visual Studio’s Build menu (or should I say BUILD menu?). Now open Outlook 2013 and select a mail item. The custom ribbon should be visible but who cares?! We are here to see the custom context menus. Right click the selected mail item and I hope you see a right-click menu similar to the one below. If you have a system with a pre-Outlook 2010 version of Outlook installed, you can run the project there and test it out. That is, if you have Visual Studio and ADX installed on it. If not, you can create a setup project and install the TyActions add-in. Or you can take a look at this screenshot and have confidence it works in Outlook 2003 as well. Yes, this is entirely possible. Can you provide more information regarding your exact scenario? Could you send your Email-id so that I will send you the exact scenario in the document. What you want to do is use the ADXRibbonMenu’s OnCreate event to build the menu. As I understand it, you have a form that you will use to define some URLs. Each URL you create with the form will reside in the add-in settings. You want to you use the OnCreate to read the settings and add buttons for each URL the user has defined. ctl.Caption = "Dynamic Button (" & DateTime.Now.Ticks & ")"
You will need to change it to use your add-in’s settings file. BTW – Dmitry deserves an assist on this one. but i want to that when selected multi email and click right mouse, it will display Try Action in the content menu. Please help me. thank you!. Install the add-in we describe at https://www.add-in-express.com/creating-addins-blog/2015/04/15/creating-office-context-menu-addin/ to find the name of the context menu which is open when you right-click selected objects. Then modify the add-in above to use that menu name by the ADXRibboncontextMenu component; see step #3 in section Add the ribbon context menu to Outlook 2013 and 2010 above.